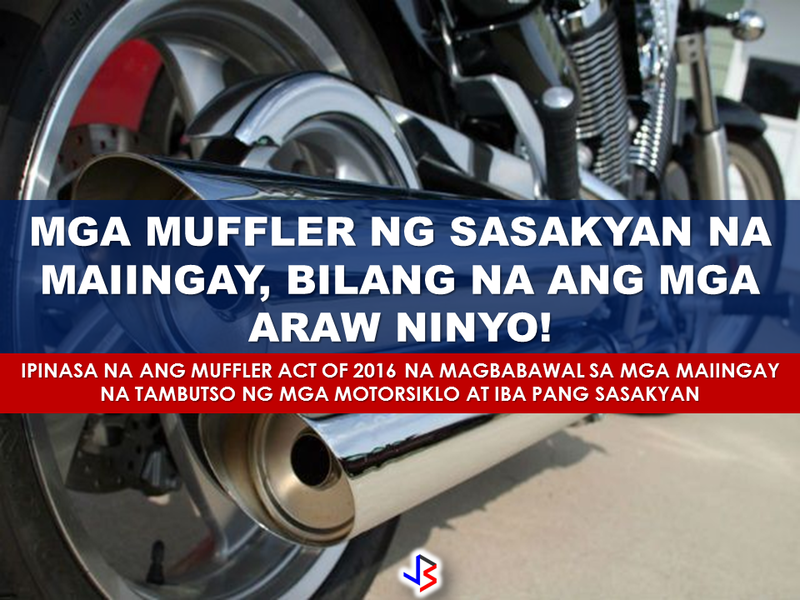 Mufflers are made to "muffle" or to lessen the sound of the engine while it burn fuel but for some motorcycle modification enthusiast, they want it the other way around. They want it to sound as loud as hell without putting into consideration the noise pollution they bring as they rev up like there will be no tomorrow. 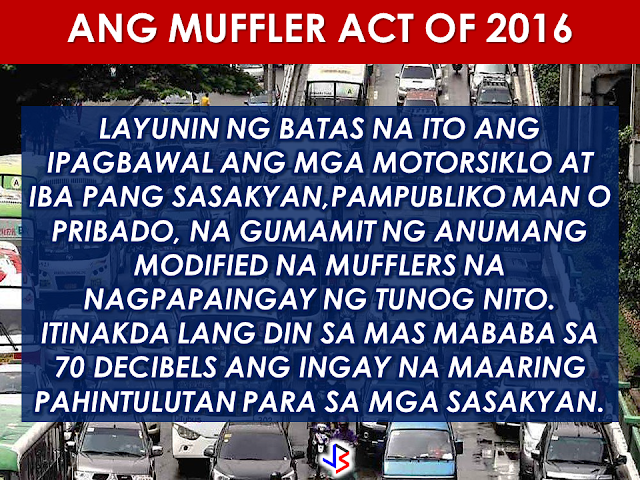 The noise that can be generated from these modified mufflers can cause not only annoyance but serious hearing damage as well. The tolerable audio level for the human ear is ideally below 85 decibels. 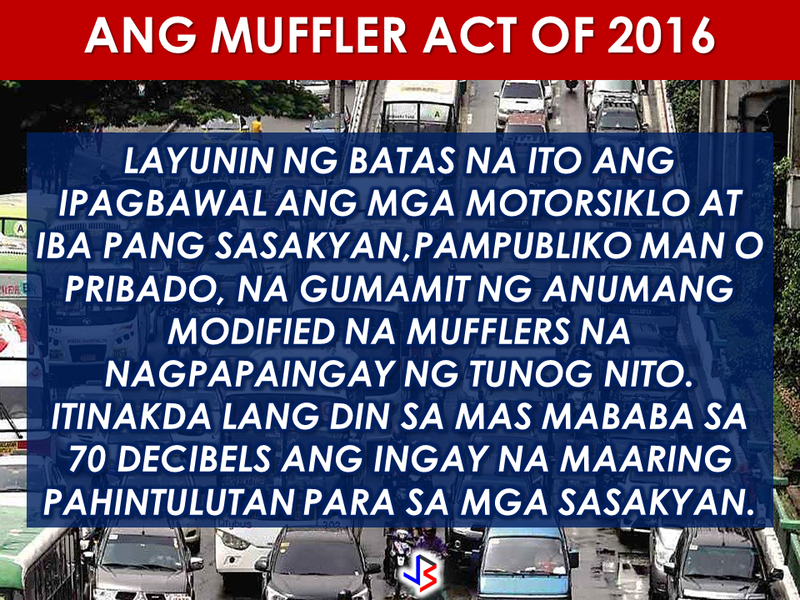 These mufflers can produce up to 120 decibels at a distance of 15 meters. Imagine,you are on a deep sleep when some inconsiderate neighbor drive by with an ear shattering muffler.Studies show that loud noises and low frequencies can fracture body parts and organs. He ordered over 200 motorcycles in Davao City. “Noise is a pollutant, it destroys the hearing of the people. It disturbs the public peace. It’s unlawful and by law I am allowed to abate that nuisance,” Duterte said. The law only applies to industrial establishments and it does not include motor vehicles and automotives. The Muffler Act of 2016 is a bill that will make the owners of loud, noisy mufflers criminally liable.The bill seeks to ban motorcycles and all sorts of vehicles, both public and private, from using any modified form of muffler that only serves to make the output louder. 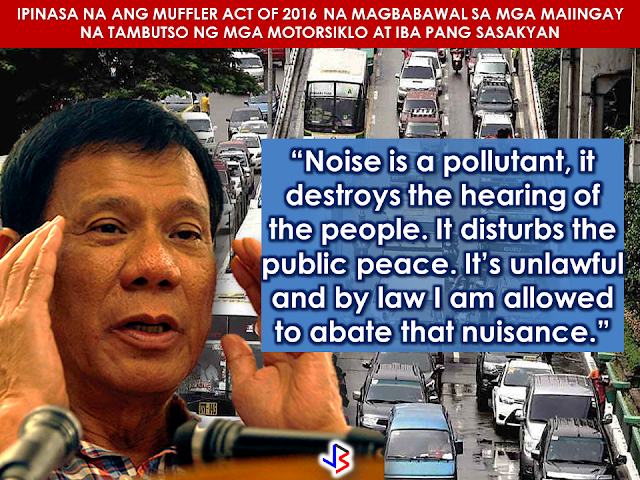 The bill also sets a noise limit for the vehicles, requiring them to be no louder than 70 decibels. The bill exempts vehicles designed for use in sports competitions and motor shows.